Fried green tomatoes are a southern staple. Green tomatoes are under-ripe tomatoes. They are more tart, and their texture is firmer. Because of this characteristic, they are a good product to fry. They don't fall apart in the high heat and the bubbly oil. They also do not have large amounts of moisture that will cause the oil to pop/explode. Instead the texture softens slightly and the tomato holds together well. The final product can be used to put into burgers, dipped in pimento cheese, or placed on top of a fresh salad. I used fresh spinach, dried cranberries, chopped pecans, and goat cheese to create a salad that lightens the southern soul food classic. 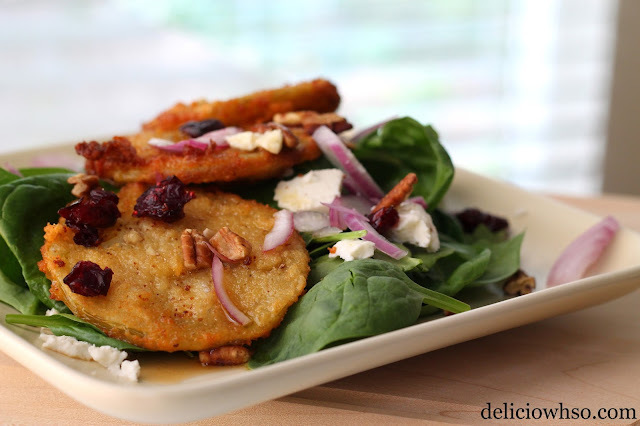 Fried green tomatoes can often be very heavy since they are fried, but it pairs nicely with the components of the salad. Finished with an apple cider and honey vinaigrette, this salad is a healthy and light alternative to heavy and greasy southern soul food. 1. Use a sharp knife to cut the tomato into 1/4 in thick rounds. 2. Put flour, egg, and breadcrumb each into separate wide bowls. 3. Dip each tomato slice into flour, then into the egg, and then into the breadcrumb. Coat on both sides. 4. Heat the oil to about 375 degrees F. You can test it by dropping a tomato into the oil. it should immediately float and begin to cook. 5. Remove tomato after the color is golden, about 3-5 minutes. If the color is changing too quickly, the oil is too hot and you should lower your heat. 6. Place finished tomato onto a plate with a couple layers of paper towels to soak up excess oil. 2. Whisk quickly to combine and emulsify the mixture. 1. Thinly chop red onion. 2. Place spinach into a salad bowl. 3. Crumble goat cheese into the spinach. 4. Sprinkle cranberries and pecans on top of the salad. 5. Pour dressing onto the salad.